Lead forms - Create Salesforce forms that will appear automatically as viewers watch videos. For information, see Creating Custom Lead Forms for Salesforce. Follow these steps to setup the connection between Video Cloud and Salesforce. Select Salesforce as the integration. 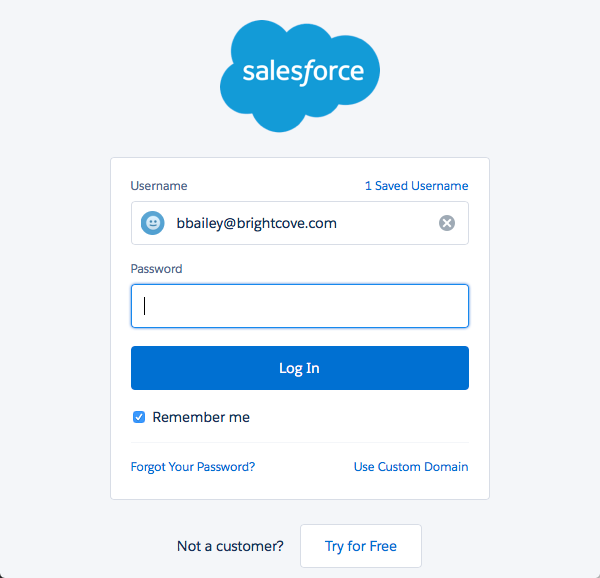 On the login screen that appears, enter your Salesforce Username and Password. Click Log In. 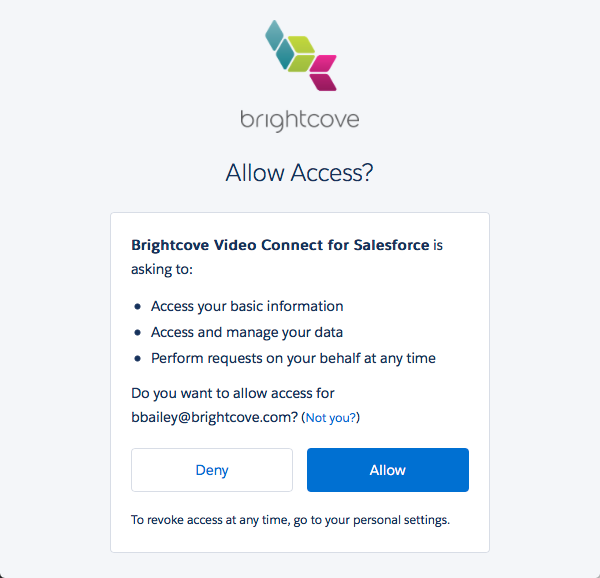 If the login is successful, you will prompted to install the Brightcove Video Connect for Salesforce app. Click Allow. The Video Cloud connection to Salesforce is now set up and ready to use. 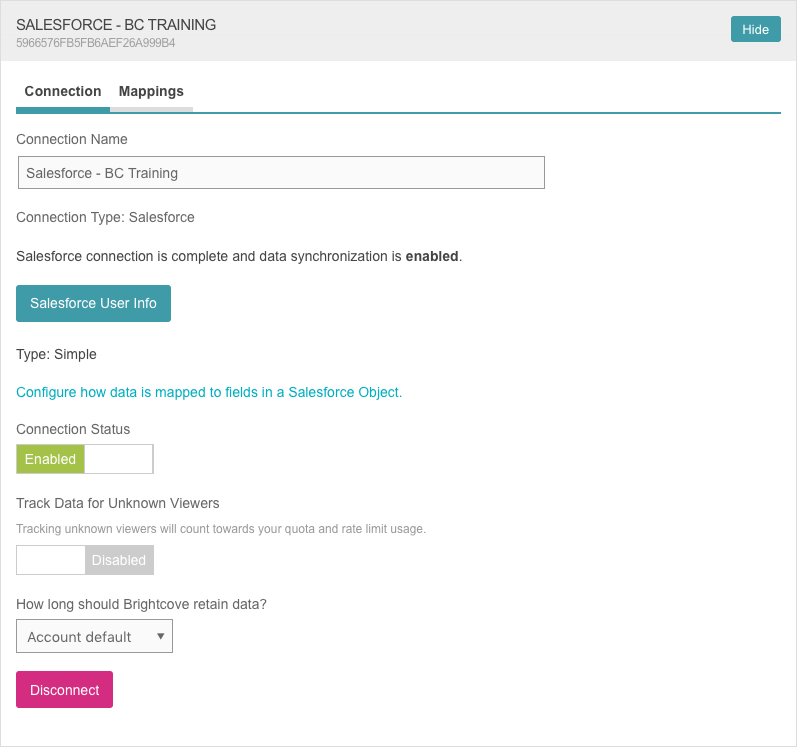 Once the Video Cloud to Salesforce connection has been made, you can configure the integration. Click Salesforce User Info to see information about the account that was used when setting up the integration. By default, the Connection Status will be Enabled. The Connection Status determines if Video Cloud video engagement data is sent to Salesforce. Data mapping determines how video data is mapped to fields in a Salesforce object. 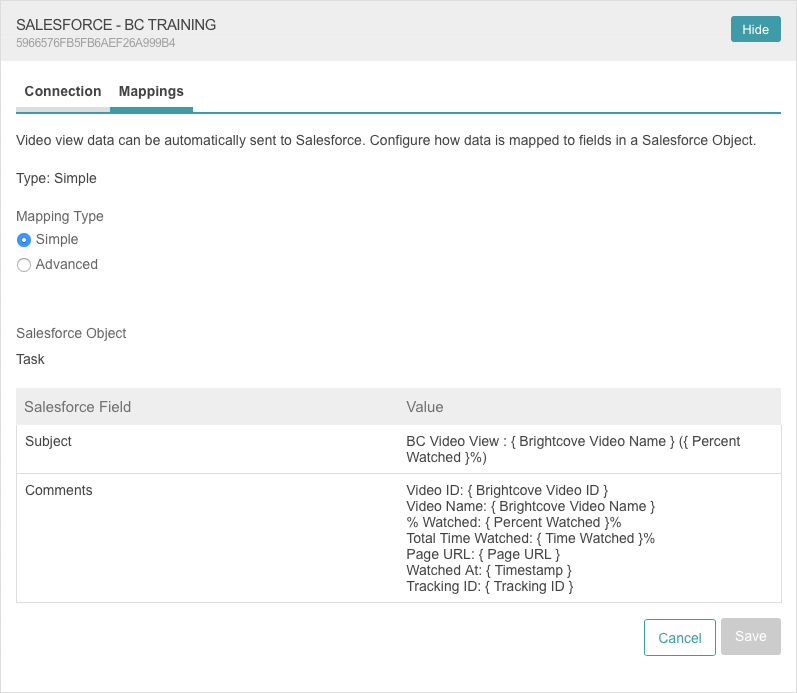 By default, the integration will be configured using Simple mapping which maps some video data to the Task object in Salesforce. Follow these steps to customize the data mapping. For the Mapping Type, select Advanced. In the Salesforce Object dropdown list, select an object to map the video data to. Map the appropriate View Field to Salesforce fields. To remove the integration with Salesforce, click Disconnect. The Audience module supports multiple connections to marketing platforms. Click Add New Connection to configure additional integrations. Video engagement data will only be sent to Salesforce when you are using an Audience-enabled video player. For information on creating an Audience-enabled Brightcove Player, see Creating an Audience-enabled Player. Audience will then pass that value along to Salesforce as another field that is synced. In this scenario, video landing pages would be generated with a URL that’s been uniquely generated for tracking purposes. The Audience module will then use the URL parameter to look up the user server-side and sync viewing data. In order for the player/plugin to read the URL parameters, the Advanced Embed (in-page) publishing code should be used. The Standard Embed (iframe) publishing code will not work as the plugin will be running inside of an iframe and therefore is unable to access the parent page URL which has the parameter. As videos are viewed in Audience-enabled players, video viewing data will be synced to Salesforce. If the Simple data mapping option was selected, video view data will appear as a Task entry inside Salesforce. 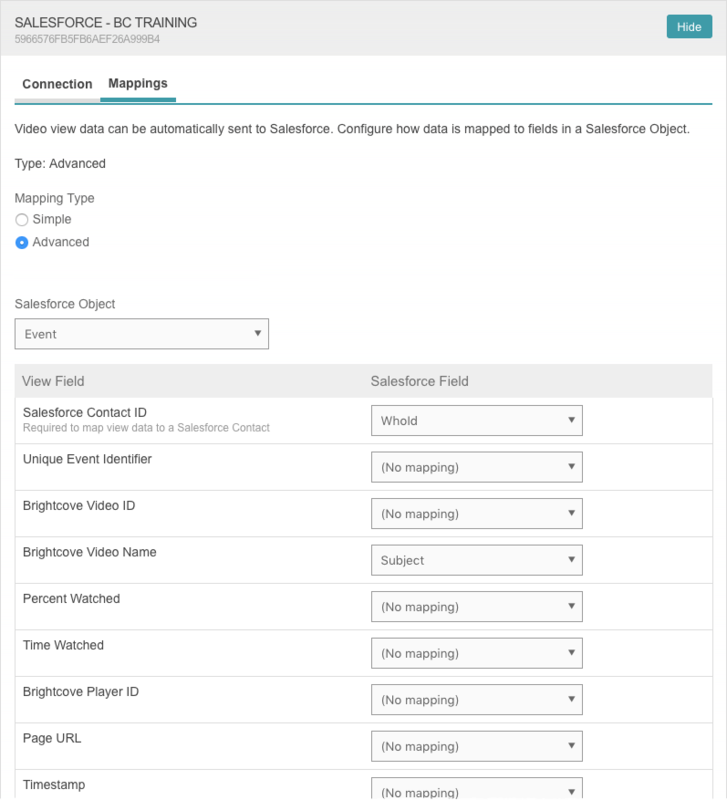 If the Advanced data mapping option was used, viewing data will appear as part of the Salesforce object that was selecting when the mapping was configured. In the following example, Simple data mapping was used. Viewing data appears as part of the contact's Activity History. The Subject will display BC Video View along with the video name and percent watched. Clicking the Task will display additional information in the Comments field.